The AWS Safety in Welding Course is now FREE! Based on the ANSI Z49.1:2012 Safety in Welding Standard, this course includes a broad range of topics, including hazards, safety equipment, ventilation, welding in confined spaces, safety precautions, and safety specifications. 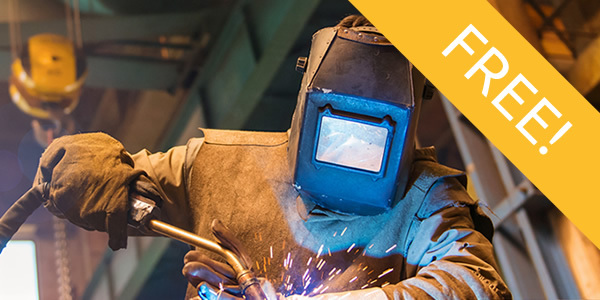 Presented in easy-to-access, online modules, the AWS Safety in Welding course is equally accessible to students, hobbyists and established professionals who want to expand their knowledge base and core competencies. The American Welding Society is accredited by the International Association for Continuing Education and Training (IACET) and is accredited to issue the IACET CEU. Participants who would like to receive professional development hours (PDHs) for taking the online Safety in Welding class must register for the course and receive a minimum score of 85% on the completion exam. The AWS Safety in Welding course is ideal for anyone engaged in welding, cutting, brazing, or soldering. Whether you’re a student, hobbyist, or seasoned professional, keeping abreast of the latest safety and health regulations and best practices is essential to everyone in the welding industry. Participants have access to the course content 24 hours a day for a period of 30 days from the date of registration. After this 30-day period, participants will have an additional 10 days to pass the completion exam. The exam can be activated before the end of the 30-day period if the participant has completed all the modules. Does this course include a completion exam? Yes. Upon completion of the final course module, participants are prompted to take an exam designed to evaluate their comprehension of the subject matter. The completion exam consists of 35 multiple-choice questions and must be completed within a 60-minute period. Participants who do not attain the 85% passing score may attempt to retake the exam a second time. Participants who attain a score of 85% or more on the completion exam earn an AWS Certificate of Completion and 3 Professional Development Hours (PDHs). The AWS Certificate of Completion can be downloaded and printed directly from the webpage. Do I need to purchase any other materials? No. All the materials and resources necessary to complete the course objectives are included. Do I receive Professional Development Hours (PDHs) for completing this course? Yes. Participants that receive a score of 85% or above on the completion exam will receive an AWS Certificate of Completion and 3 Professional Development Hours (PDHs). Can I use these Professional Development Hours (PDHs) for recertification? Yes. Professional Development Hours (PDHs) earned through AWS online courses can be applied towards recertification provided the PDH’s are earned during the certification period. Do I receive Continuing Education Units (CEUs) for completing this course? Yes. Participants that receive a score of 75% or above on the Completion Exam will receive an AWS Certificate of Completion and 0.3 IACET Continuing Education Units (CEUs). Can I use these Continuing Education Units (CEUs) for recertification? Yes. Continuing Education Units (CEUs) earned through AWS online courses can be applied towards recertification provided the CEUs are earned during the certification period. Will this course help prepare me for the Certified Welding Inspector Exam? Yes. The Certified Welding Inspector Fundamentals Exam (Part A) contains questions concerning the topics covered in this course. This course is designed to help prepare participants for this section of the exam. What platforms and devices can I use to view AWS Learning online courses? You must be connected to the internet to access AWS Learning online courses. AWS supports the most recent versions of Google Chrome, Firefox, Safari, and Internet Explorer. Courses can be viewed on desktops, laptops, tablets, and mobile phones. Note, however, that a high speed internet connection and large screen offer a better user experience.